Surrounded by Nepal, China and Bhutan, Sikkim is regarded as one of the last Himalayan Shangri-las. Due to its remoteness and the fact that permits are required, Sikkim isn't the most accessible area to visit in India. However, it certainly is the most energetic and refreshing. There's something very calming to the soul about the mountainous beauty and ancient Tibetan Buddhist culture in Sikkim.Here are five popular Sikkim attractions and tourist places that one should certainly visit. Testament to the fact that Sikkim is a marvelous place for meditation, nearly 200 monasteries cover the hilltops. The most visited monasteries in Sikkim are Rumtek , Pemayangtse, and Tashiding. Other monasteries worth visiting include the Karma Kagyu monastery with its 200 year old murals, the Enchey monastery and the old Sanga-Choeling monastery. Sikkim is a trekker's bliss. The trek from Yuksom to Dzongri Peak, and further on to Goecha Peak is the most popular trek in Sikkim. It passes through the forests, magnificent rhododendron gardens, and powerful rivers of the Kanchenjunga National Park. Additional trekking permits are mandatory for foreigners. The Teesta River is said to be the lifeline of the of Sikkim, flowing for almost the entire length of the state and carving out verdant Himalayan temperate and tropical river valleys. The river then forms the border between Sikkim and West Bengal before joining theBrahmaputra as a tributary in Bangladesh. Before a large part of this was situated in Nepal. River rafting is the latest adventure activity to arrive in Sikkim, and the Teesta River offers some world class opportunities. The major route is Makha-Sirwani-Bardang-Rongpo. Nothing compares to a journey along the former Old Silk Route to Nathu La, three hours from Gangtok on the Chinese border. The border consists of a lone barbed wire fence, and one will get the strange thrill of seeing the Chinese soldiers on the other side. Foreigners can go up to Tsomgo Lake, also called Changu Lake. Sikkim is renowned for its astounding variety of birds, animals, and flowers -- over 450 species of birds, 400 species of butterflies, 450 varieties of orchids, and 40 species of rhododendron. Two of the best places to see them are the Deorali Orchid Sanctuary in south Gangtok, and Kyongnosia Alpine Sanctuary around an hour from Gangtok on the way to Tsomgo Lake and Nathu La. 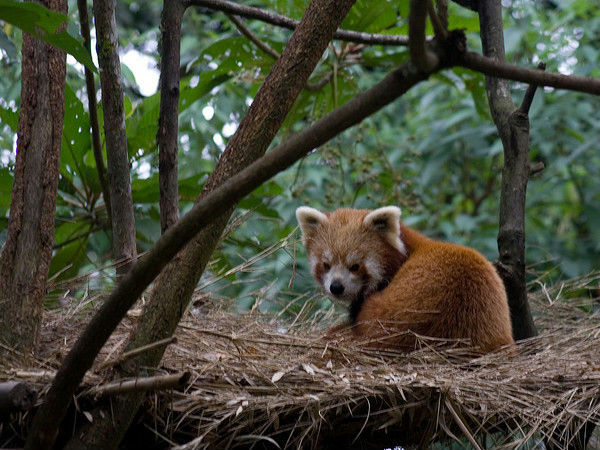 One may also come across the red panda which is the state animal and an endangered species.